Furry background courtesy of my dog, Peanut. 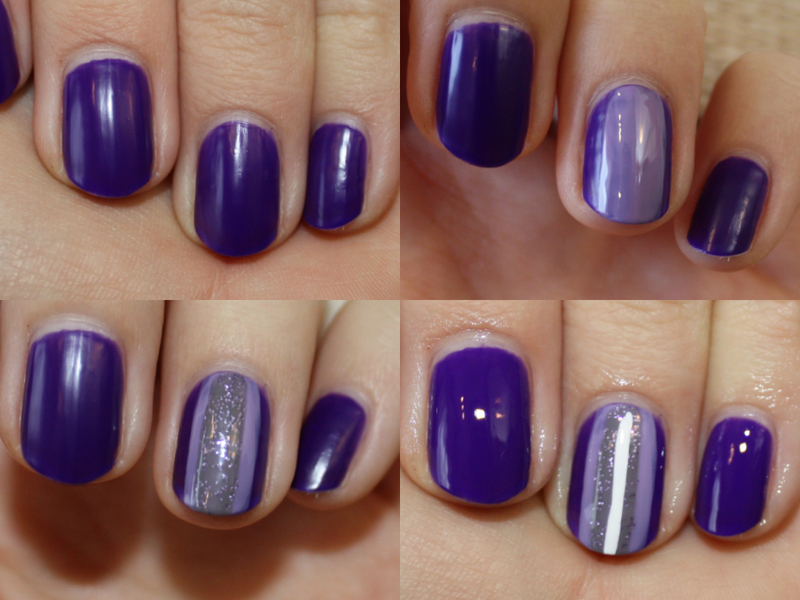 Gradients are a fun and easy way to add dimension to your nails. Apply to all fingers or as an accent. Choose complementary shades in the same color family for a more polished look. You will need a base color and three lighter colors to complete the gradient effect. Begin by applying two coats of Color Club's Disco Dress (note: this color is incredibly flat, but comes alive beautifully under a glossy top coat). Paint a stripe of OPI's Do You Lilac It? down the centre of your accent nail. I applied two coats of this color to make it pop against the darker base. Paint a thinner stripe of Butter London's No More Waity Katie down the centre of the previous stripe, making sure the previous stripe is still visible on either side. Using Art Club's White paint a thin stripe down the centre of your previous stripes. Allow to dry completely and apply top coat. OPI in Do You Lilac It?